Several hundred thousand pieces of waste, commonly known as space junk, litter low-Earth orbit, potentially causing hazardous conditions for rockets and satellites. A group of scientists would like to shoot this junk from the ground with high-powered laser pulses. The heat from the laser blasts would vaporize a minuscule part of a piece of space junk, resulting in a plasma jet that could slow the object down enough to bring it out of Earth orbit. “You’re essentially creating a laser-powered rocket, using the object to be its own fuel,” said engineer Claude Phipps of the company Photonic Associates, LLC, who co-authored the laser-removal paper, published Oct. 17 on arxiv. Space junk, which ranges from tiny paint flecks to bulky decommissioned satellites and spent rocket stages, is reaching a tipping point. After decades of assuming that low-Earth orbit could handle almost unlimited waste, space agencies have recently realized that the current density of space junk is high enough for collisions to start becoming inevitable, with each crash potentially creating hundreds of new objects to worry about. This scenario, originally posited by astrophysicist Donald Kessler back in 1978, means that spacecraft entering low-Earth orbit would have to fear running into space junk that could puncture their hulls. Two years ago, a communications satellite crashed into a defunct Russian spacecraft in the first major sat-on-sat collision. And earlier this year, the crew aboard the International Space Station was forced to take shelter in the Soyuz escape craft when a bit of space junk wandered precariously close. NASA has considered many proposals for cleaning up space, including mesh nets strung between inflatable booms or unmanned collecting barges that would fly around picking up trash. 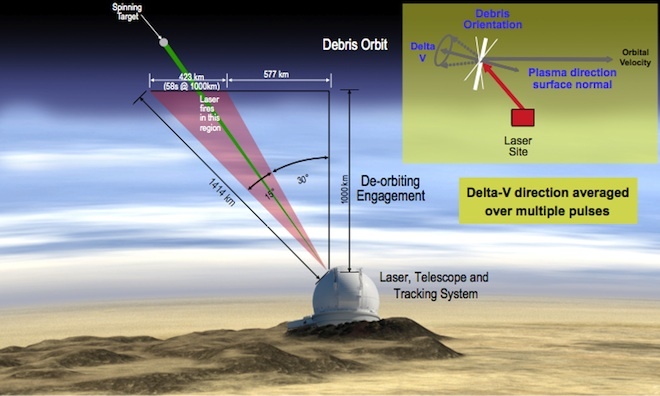 They have even previously contemplated a ground-based laser removal system: a medium-powered laser that would use the small momentum imparted by photons to nudge an object out of orbit. But such an approach would be mostly limited to lighter objects, leaving behind the most hazardous material, said Kessler, who is NASA’s former Senior Scientist for Orbital Debris Research. More powerful lasers, with roughly 150 kilowatts of power, should be capable of adjusting the orbit of almost any size object. The smallest debris (less than 3 feet in size) would burn up in the Earth’s atmosphere after being slowed down and falling out of orbit, while larger pieces might need to be aimed properly to land in the Pacific Ocean. Using ground-based lasers eliminates the need to launch a vehicle into space, which could cost hundreds of millions of dollars. Phipps’ team estimates that removing a small object would cost a few thousand dollars and large objects would be about $1 million. Still, the technique requires caution, said Kessler. “If you’re not careful, you might hit the wrong part of a satellite or could vaporize enough to cause it to explode,” he said. Phipps is confident that a dedicated 10-meter telescope could be built with the necessary capabilities to track space junk and properly calculate where and how to hit it. All of the technology needed for such a facility, including a large enough mirror and powerful enough laser, currently exists or is under development. Perhaps the main criticism of such a project would come from the international community, which might fear that a powerful enough laser could be used for military purposes such as hitting enemy satellites. Because of such political complications, NASA’s official line is that “any laser proposal is dead on arrival,” said Kessler. But Phipps, who has advocated for the ground-based laser solution since 1996, thinks that the junk-tracking facility would have to be part of an international effort. Roughly half of space debris comes from either Russia or the U.S., so they should be natural partners in addressing this issue, he said. Other countries interested in space launches could also get involved. “If we get the right international cooperation, no one would believe the laser to be a weapon in sheep’s clothing,” he said.